Facebook has never made a secret of its desire to dominate almost every aspect of daily life in the digital age. The company has blatantly swiped features from Twitter, Snapchat, Foursquare, Periscope, and more. It’s also experimented with workplace collaboration tools, the ability to call Lyft and Uber rides in Messenger, and a food delivery feature. Now the social networking giant has plans to capitalize on the massive online dating market and “borrow” from a Millennial-favourite brand: Tinder. The new feature is for Messenger and was spotted by Motherboard’s Jacob Dubé, who noted that it was also available to some of his friends in Canada but none of his colleagues so far. “While using Facebook on my phone Wednesday night, I was greeted by a notification that said ‘[Name redacted] and 15 others may want to meet up with you this week,’” Dubé wrote on September 7. After clicking the link, he was greeted by photos of his Facebook friends and the question "Want to meet up with [name redacted] this week?" Facebook indicated that notifications would only be sent if both users said yes. Tap “No Thanks” and the other party would be none the wiser. People often use Facebook to make plans with their friends. So, we're running a very small test in the Facebook app to make that easier. We look forward to hearing people's feedback. Though the influence of Tinder is clear, Facebook’s feature is not an exact clone of the popular dating app. 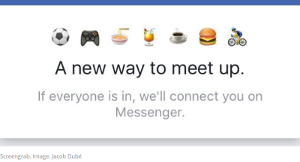 Rather than connecting strangers, it appears that Facebook will only connect people who already know each other (and therefore can chat via the Messenger app anyway). It seems to display friends along with potential love interests, perhaps meant to encourage any kind of relationship to move from behind the screen to real life. It’s safe to say that if Facebook’s latest rip-off feature tests well in beta, we have a wide release to look forward to in the near future. It is not known, however, whether Messenger users will have the option to opt out of it if they’re not interested in participating. Nor do we know how Tinder feels about Facebook’s swagger jacking.